Get windsurfing lesson gift certificates here! This class is specifically designed for the beginning windsurfer. The step by step system of land simulation followed by water practice will allow a beginner to learn quickly. Groups of 2 to 6 people per instructor. This class is specifically designed for the beginning windsurfer,and you get the instructor all to yourself. the step by step system of land simulation followed by water practice will allow a beginner to learn quickly. -Wind foiling lessons are also available! We have foil gear from Slingshot, Fanatic, Starboard, and Sailworks. Let our expertise get you flying in no time. Our beginner lessons are 3 hours long, and almost everyone is windsurfing on their own before the lesson is over. One lesson gets you a solid foundation in the basics. You may want more lessons as you progress to learn how to use a harness and sail in higher winds. You will be in the water and being active - so dress for comfort. Bathing suits and board shorts are fine, you may want to wear a rash guard or t-shirt you don't mind getting wet for sun protection. In the winter months the water may be chilly - we do have wetsuits to fit most people if they are necessary. You may want water shoes, but it is fine to go barefoot too. You will want to bring sunscreen and water. No problem! We emphasize technique and balance when learning to windsurf and we have specialty beginner gear that is light weight and easy to handle. Of course! Windsurfing is a great sport for people of all ages. The only requirements are that you be comfortable in the water, able to get from a sitting or kneeling position to standing, and that you want to learn to windsurf. 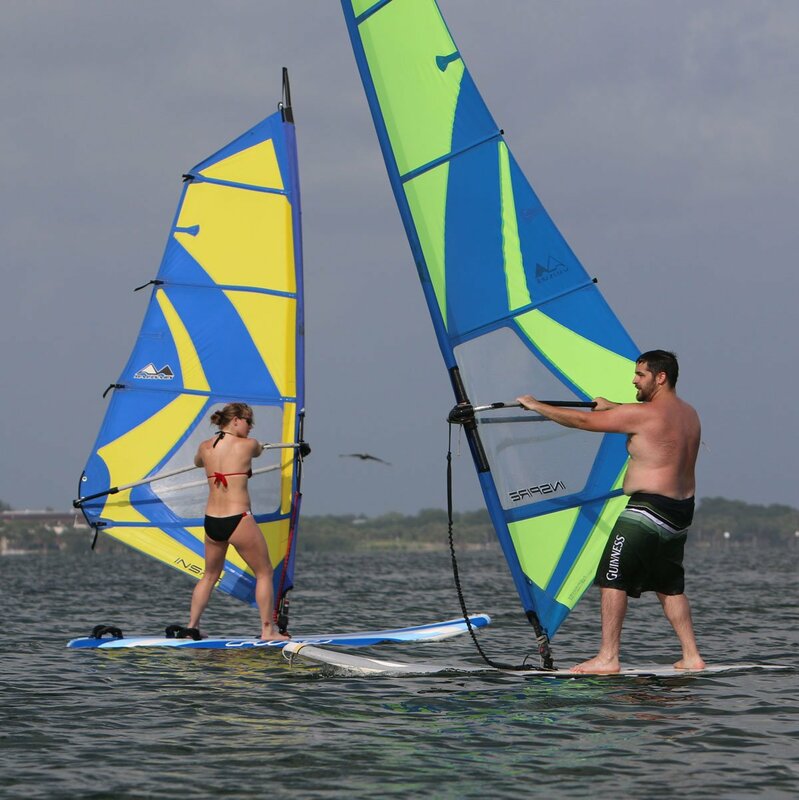 Click here for more specific info about kids windsurfing. Yes. You do not have to be a fantastic swimmer, but you do need to be able to swim a short distance and most importantly be comfortable in the water (i.e. you won't panic if you fall into deep water). Often, our lessons take place in areas that are only 2 to 4 feet deep - but you may also be in water that is over your head. We provide life vests if you request them ahead of time.